On the second day of our trip, we slept in a little, having stayed up a bit late after a late dinner. After getting coffee and water, we walked approximately 14 blocks to Central Park and then walked across the park to the (other side) to meet another New Yorker friend of mine, Rebecca, at a restaurant near Lincoln Center that she had picked for us. We had a very nice lunch and Rebecca made some additional recommendations for things we hadn’t thought of. 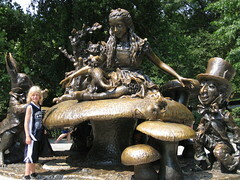 After lunch Dominic and I went back into Central park, walking by a pond seeing the Hans Christen Anderson and Alice in Wonderland statues. It was strikingly hot but we continued to walk up the park noticing various musicians playing for tips along the way. We were looking for the Central Park Zoo but were not paying much attention. Dominic picked up a few sticks which he proceeded to use to “play” an empty water bottle located in his messenger bag. 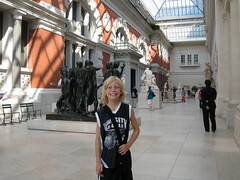 The heat was intense, so we decided to take a break from it by entering the Metropolitan Museum ??? MET. There was a Superheroes exhibit, although, we were not sure exactly what that would be. Dominic put his sticks in his bag, worried they might not let him have them. They didn’t notice the sticks when the bag was inspected. The AC in the museum was a welcome relief to the sweltering heat outside. We checked out some Greek artifacts and then a Medieval exhibit before finding the Superheroes exhibit. It was a combination of movie props from Spiderman, Batman and Iron Man plus fashion designer interpretations of various Superhero themes in clothing designs. After the MET, we wandered outside where the sun dropped enough to be blocked by many of the taller buildings. 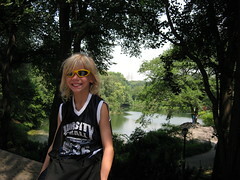 It was still very hot and humid though and by the time we finally made our way to the Central Park Zoo (which just closed) it had taken it’s toll on Dom. we rested for a while and then made our way back to the hotel. 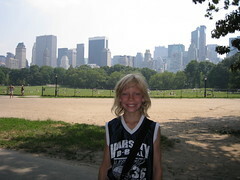 This entry was posted in Travel and tagged dominic, lee, new york, nyc, Travel, vacation. Bookmark the permalink.